Suggested 75¢ - $1.00 vend. Will dispense in machines with a 2" vending wheel. 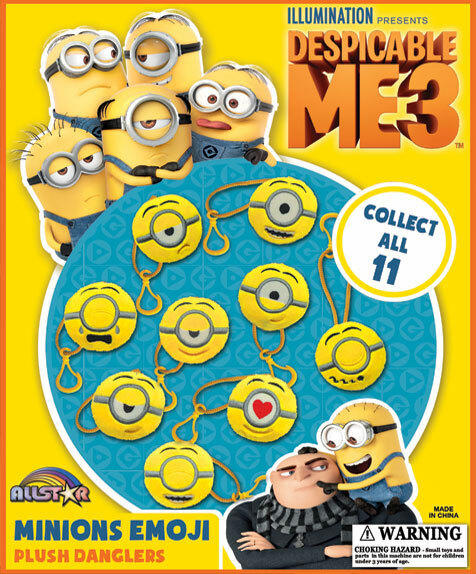 Our Minion Emoji Plush Vending Capsules are going to fly out of your vending machines. Minions have become very popular since we first met them back in 2010 with their evil master, Gru. Emoji faces include smiley faces, crying face, and heart eye. Collect all 11! The display card (as pictured above) is a printed display with a sampling of the items found in the mix and is included FREE.